Excelerate360 provide high quality business growth services. Based on feedback and insight from our clients over the last 4 years, we identified that successful business development campaigns require a blend of content marketing, data preparation, digital marketing, telemarketing and sales management. Making 100 cold calls a day, in isolation, simply doesn’t work anymore. For this very reason, we have developed the E360 POD - a multi-skilled team of inside sales managers, marketing specialists, researchers and business development representatives that work together to deliver end-to-end sales opportunities. For a fixed monthly fee, we will allocate a mix of these specialist resources, according to the campaign needs at any given time. The beauty of this model is that we flex the blend of resources throughout the campaign. For example, at the start of the campaign it is likely that we will need to invest more time creating digital content for emails, social outreach and LinkedIn posts. Consequently we will dial down the telemarketing activities during this start up phase. Conversely, once we have a range of suitable digital content we will dial down the marketing input and ramp up the digital and telemarketing outreach time. Typically equivalent to the cost of a full time person, the team (which is led by an experienced Account Director) delivers multi-channel digital lead generation involving online, social media, content marketing and seeding plus email supported by both telemarketing and personal outreach. The Account Director assigned to this team will be an experienced sales leader with a proven track record of new company growth. 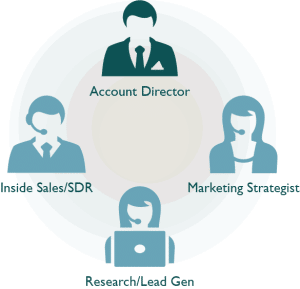 The Account Director also becomes your direct contact, helping you gain maximum visibility and help manage local performance to ensure that we optimise the reach in order to achieve the most impact when it comes to the creation of sales opportunities through to your inside sales or telesales requirements. We invest time in getting to know your business and understanding the key factors that will make your campaign successful. We work on-site with you conducting an in-depth business profile to understand what you have in terms of content, target personas, data and planned marketing activities. We then use that to start training the team with your input and support. A critical success factor for any campaign, we will work with you to align great quality contact data to your campaign from our own database or build high quality new data if required (additional costs applies). We use social selling, digital and email marketing as a forerunner to telemarketing. Our Marketing Strategist will work with you to develop the right message tone that leverages your key USP’s. We use our own internal CRM system. This has been specifically designed for the purpose of lead generation. You will receive a full campaign activity report which gives insight to how your campaign is performing. All leads and meetings generated are sent separately at the point of generation and summarised in the monthly report. These can then be uploaded to your own CRM at an agreed process point. We believe in quality, this has always been the foundation for our business. If a lead or opportunity does not meet the agreed standard it will be re-qualified or replaced.